These classes include therapy ball self-massage and lots of the strengthening, stretching, and outside-the-yoga-box movement that keeps the body feeling great! Appropriate for MOST movers - movement options are provided and class is scalable for a variety of levels. After this more leisurely Sunday class, we encourage you to stay for coffee / tea / hot chocolate and community time if you can! These classes consist of a bit more challenging blend of strengthening, stretching, and outside-the-yoga-box movement - but nothing that isn't practical and fundamental to our bodies! Appropriate for ABLE movers - Not for those with more significant restrictions in movement. Must be able to bear weight on the hands & knees, and rise easily from floor to standing. Exactly what it sounds like... GENTLE movement & yoga! We will move slowly, breathe deeply, stretch & strengthen gently, roll a bit on the therapy massage balls, and come out on the other side with a deep feeling of rejuvenation. Perfect for ANY mover - those beginning the journey, or for when you just want to take it slowly. 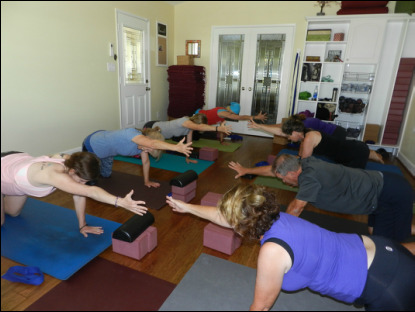 YOGA MOVES Gentle is also a great session for bodies with injuries or other conditions needing a slower pace, or for those who need to ease their way back into movement.